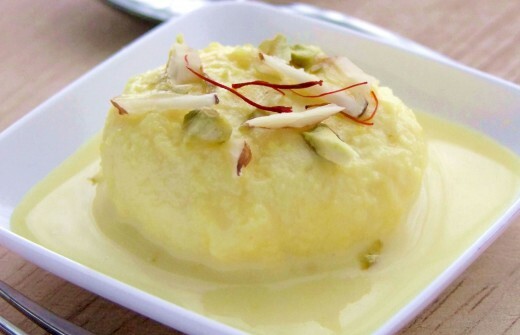 Ras Malai: Ras Malai or Rosh malai is a dessert eaten in India, Pakistan and Bangladesh. Ras Malai consists of sugary white, cream or yellow coloured (or flattened) balls of paneer soaked in malai (clotted cream) flavoured with cardamom. Ras malai is believed to have originated in Odisha. It is one of the most famous desserts in that region and is likely based on the rasgulla, which is a close variation. Slowly add in the lemon juice. When the milk curdles (paneer), remove from feat. Strain the paneer in a cheese cloth (or muslin cloth). Wash the paneer under running water to remove the sourness from the lemon. Hang the cheese cloth with paneer on the tap for approx 30 minutes to remove all of the liquid. Remove the paneer from the cheese cloth and run it through a food processor to smooth it out. Note: You can knead the paneer by hand but it will take a long time to make it smooth. Divide the smoothed paneer into 12 equal portions, a little smaller than the size of a ping pong ball. Roll the portions in your hands until a smooth ball is formed. Lightly press the ball until it flattens out. In the pressure cooker with water, dissolve 1 cup sugar and add the flattened paneer balls. Close pressure cooker lid and cook until one whistle sounds. Immediately switch off the stove and set the timer for exactly 5 minutes. After 5 minutes, remove the pressure from the pressure cooker. Remove the cooked paneer with a slotted spoon into a bowl. Allow the cooked paneer balls to cool down. Cook the milk till the milk is reduced to half. Add green cardamom powder, saffron strands and sugar, to taste. Once the paneer balls are cooled enough to handle with your hands, gently squeeze out the sugar syrup from the paneer balls and place them in a serving dish. Pour the prepared ras (reduced milk) over the paneer balls and chill in the refrigerator. Ras malai is ready to be served. Serve chilled, garnished with chopped nuts.